For Carol Luckhardt Redfield, Ph.D., teaching isn’t a one-way process. She believes that effective teaching — and learning — requires students to be engaged in the effort. Considering how much of her time and teaching centers on game development, that makes sense. Recognizing the role games can play in learning, Redfield recently introduced a graduate certificate program in Educational Computer Gaming, making St. Mary’s only the second university in the nation to offer such a certification. Students in this program will learn to develop these kinds of games in preparation for careers in the emerging industry of game-based learning. Her enthusiasm is obvious, and it rubs off on her students, who eagerly demonstrate the games they’re creating. Redfield doesn’t limit her teaching to college classes; she is a longtime volunteer at the John Jay Science and Engineering Academy (SEA), a magnet high school in San Antonio. Her impact there has been so great that the Northside Independent School District recently saluted Redfield with an Outstanding Individual award for advancing education in the district. “I was thrilled to be recognized for something that I love to do: educate students and provide education in STEM (science, technology, engineering and math) fields,” said Redfield, who began helping at SEA when her son enrolled there in 2006. Principal Jay P. Sumpter nominated Redfield, noting that her work at SEA has generated about $1.5 million in college scholarships for students. St. Mary’s awards seven $40,000 scholarships annually to the fair’s top winners, who then present at the University’s annual research symposium. 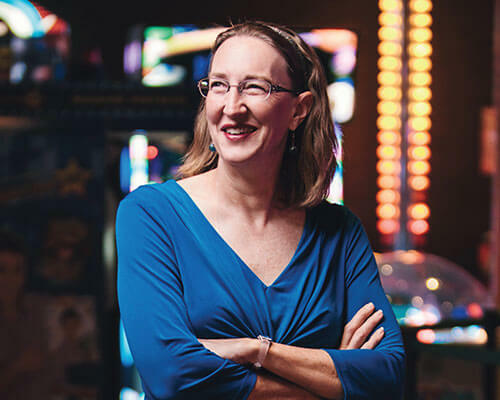 In addition to her work with the science fair, Redfield serves on the school’s advisory board, has created teacher appreciation initiatives, presents on artificial intelligence and computer game development, tutors and even coaches the Ultimate Frisbee club. For more information on the Educational Gaming Certificate, contact Carol Redfield, Ph.D., at 210-436-3298.